Park Services Specialist Carla Sherwin, left, and speaker Cynthia Barnett. 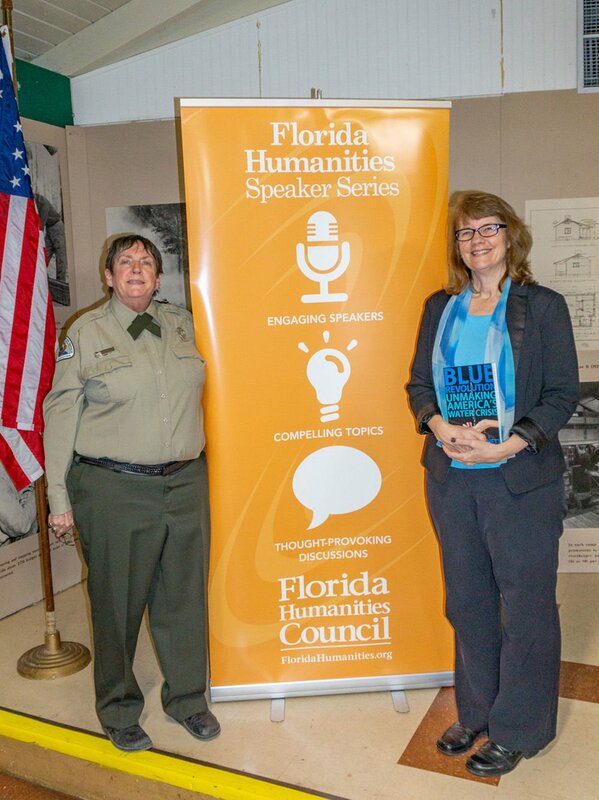 The seminar ‘A Water Ethic for Florida and America’ was presented to guests at Highlands Hammock State Park. The sun sets over one of Sebring’s most important water resources, Lake Jackson. Barnett, born in LaBelle, is an environmental journalist dedicated to the protection of natural resources in her home state. Barnett teaches environmental journalism and nature and adventure writing at the University of Florida’s College of Journalism and Communications in Gainesville. Florida is a state that seems to have an abundance of water. Indeed, we often seem to have too much, or at least too much all at once. But in fact, the youngest generation of Floridians are now growing up in a state where water resources are limited. They won’t be able to take water for granted like their parents and grandparents. The use of water will become a choice between one use and another. “The 1970s absolutely must be the years when America pays its debt to the past by reclaiming the purity of its air, its waters, and our living environment. It is literally now or never,” said Richard Nixon, as he signed into law the Environmental Protection Agency. The EPA was formed in 1970 after decades of abuse of our natural resources and environments. It was a tough pill to swallow for the many industries that were the source of pollution and neglect. But tough new laws made a difference. Rivers such as the Cuyahoga, in Ohio, which had been so badly polluted that it caught fire in 1969, were restored to much better (if not pristine) condition. Florida waters such as Pensacola Bay and Tampa Bay, home to massive fish kills in the 1960’s, eventually cleared up. It didn’t happen overnight: it took the dedicated efforts of many people over many years. Fifty years after the establishment of the EPA we are once again at a turning point. The population of Florida has skyrocketed from less than 3 million people in 1950 to over 20 million today. Of course, our water resources have not experienced the same growth. The Floridian Aquifer, one of the largest in the world, is feeling the pressure, and the depletion can be seen in springs that have dried up in parts of the state and in the salt water intrusion into some of the water supplies of some of the coastal cities.